Chicago proposal photographer Heather Parker Photography documents a surprise engagement proposal at the Adler Plantetarium with the iconic Chicago skyline as a backdrop. I love being a Chicago proposal photographer because I get the chance to document the beginning of a commitment together. Sidharth contacted me from New Jersey well before he flew into Chicago to spend time with his long-distance girlfriend Shefali and surprise her with a ring. He wasn’t familiar with the city, so he asked for help with planning the perfect surprise engagement proposal. We chatted on the phone about locations that would be special and beautiful, but wouldn’t seem completely out of the ordinary for them to visit. After texting Sid with some photos of where to meet, we finalized a plan. When he arrived to Chicago and we texted in the final few hours about where I would be standing. While these moments can’t be entirely scripted, I gave him suggestions to ensure a photo to show both of them against the iconic Chicago skyline. Sidharth and Shefali braved the cold and drizzly weather and took a leisurely stroll through around Museum Campus and stopped at the Adler Planetarium to marvel at the skyline. I spotted them and there was a brief pause and then Sidharth knelt down on one knee and proposed to Shefali. The skyline lights began to come on and it looked so magical. There was so much joy in Shefali’s face. She was shaking, even after a few minutes of hugging and kissing. I’m hoping her shaking was due to shock and excitement, rather than the chill of a Chicago weather. 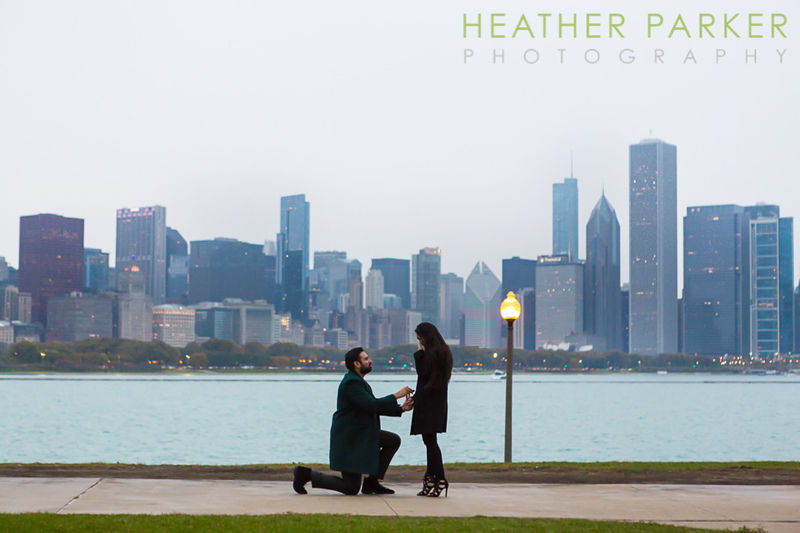 Thank you to Sidharth for hiring me to be your Chicago proposal photographer! As their Chicago proposal photographer, I captured Sidharth R. Mehta, MD and Shefali Mandhle, MD, MPH moments after they got engaged.